Jean Hagen played Danny's first wife, Margaret. She quit the show and they had Margaret die as part of the story. They had an older daughter named Terry, played by Sherry Jackson. 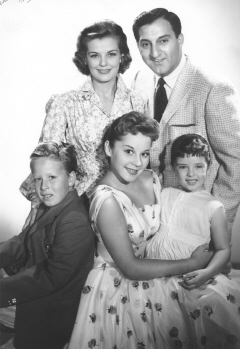 Kathy (AKA "Clancey"), played by Marjorie Lord, and Danny adopted Linda, played by Angela Cartwright. Funny thing, after Linda entered the story, Terry was rarely seen again. In the early 1970s they had a rehashing of the show called Make Room for Granddaddy. Jean Hagen died of cancer in 1977 at the age of 54. Rusty Hamer, who played Rusty, committed suicide at age 42 in 1990 at his brother's trailer house in DeRidder, Louisiana.